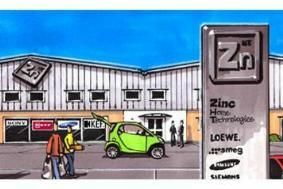 Zinc Home Technologies opens today in Hertfordshire | What Hi-Fi? Zinc Home Technologies aims to offer some of the best-known names in hi-fi and home cinema alongside top domestic appliance brands, backed up with a high level of customer service from experienced, highly trained staff. The new showroom, complete with extensive on-site parking, is said offer 'luxurious sound and vision suites' in which customers will be 'immersed in a world of exquisite audio and visual detail'. The company says that its 'demonstration facilities set new standards for the industry – the suites are extremely large, comfortable and air-conditioned and refreshment facilities are available'. Among the brands offered by Zinc HT are Linn, Naim, Loewe, Samsung, Sony, Sharp, Marantz, Denon, Bryston, PMC, Meridian and KEF, along with domestic appliances from the likes of Smeg, Fischer & Paykel, Siemens, Braun, Bosch, Neff, Maytag, Whirlpool and Rangemaster. Zinc Home Technologies is at Meteor House, Manor Way, Borehamwood, Hertfordshire, WD6 1QQ, with easy access from the A1, M1 and M25.